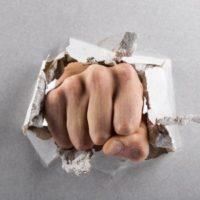 Punching holes in the wall. Breaking and throwing things. Smashing your car’s windshield. Most of us never expect to face these behaviors from our children, but it happens all too often with defiant children. We see many kids who purposely destroy family property out of anger or for spiteful, vengeful reasons. And when it happens, the parents naturally feel a variety of hurtful and negative emotions. It feels like a punch in the stomach. First comes the shock. How can my child be doing this to me? Anger, resentment, and guilt follow. What did I do wrong for my child to end up like this? Why do kids destroy property? And what should we do about it? The fact is, most kids destroy property as a way of coping. They are unable to cope with their frustrations and extreme feelings and destroying property is a release of sorts. It makes them feel better, if only for a while. But, it is a terrible way to cope. It will lead to terrible consequences down the road as your child reaches adulthood. And it needs to be taken very seriously. First, though, what leads them to this extreme place? Children are generally known for having a low tolerance for frustration. They want things to go their way. When something happens that’s unexpected, disappointing, or requires the use of coping skills, many children have a difficult time handling such situations effectively. Some older children and teens still engage in tantrum behaviors long past the age we might expect. Why? Most often, they don’t yet have the skills to handle the stress they’re experiencing. Physically releasing that energy helps them relieve their distress for the moment—even though it’s unpleasant for everyone around them. This is particularly true for children with an underlying condition such as ADHD, Oppositional Defiant Disorder (ODD), Asperger’s Syndrome, or a mood disorder. Sometimes destructive behavior serves a different purpose: intimidation. A child may learn that by breaking things, punching holes in the wall, and behaving in a violent manner, he will effectively frighten a parent into doing what he wants. Ever have a bad day and come home and picked an argument with a “safe person?” By safe person, we mean someone who you know is not likely to reject you for your behavior, such as a spouse. Think about it, we often say things to our “safe” loved ones that would get us fired if we said those same things to a boss. Our kids feel and do the same thing. When your child is feeling miserable, he probably won’t pick the neighbor to share his misery with. He’s going to pick you because he knows you love him and won’t reject him. And with adolescents, things can escalate quickly. Before you know it, your child starts releasing his feelings physically, not just verbally. Often, the most frustrating situation is when a child behaves in a passive-aggressive or sneaky manner. He may break things out of revenge for the anger they’re feeling toward a parent. You may find something of yours broken, perhaps something particularly sentimental or valuable. And you know your child did it, but you can’t prove it. Your child will deny until there’s no breath left in her body that she’s responsible. Yet your gut tells you she’s getting even for something she isn’t willing or able to share with you. What Can I Do about My Child’s Destructive Behavior? It’s a good idea to wait until your child has calmed down before telling him what the consequence will be for his actions. Don’t say to your child, “Well, I hope you liked that vase you just broke because that just became your Christmas present!” That will likely escalate the situation and may lead to more destruction. Instead, wait it out and when things are calmer, let him know how he will make amends for the damages. Below are some ideas for consequences and how to approach the consequences conversation. Tell your child that destroying property is not acceptable, not in your home and not in the rest of the world either. Be clear in your expectations and what the consequences will be if your child does destroy your property. Be very clear that frustration is not an excuse for destroying property. Talk with your child during a calm moment about things she can do instead of breaking things when she gets upset and frustrated. If she needs to release some physical energy, what are some non-destructive activities she can engage in? How can she learn some more effective ways to cope with her emotions? One mom told us her 12-year-old daughter has a trampoline she jumps on to release pent-up energy. Another parent bought his child stress balls to use so he can squeeze when he’s feeling as if he’s going to lose control. The child was able to use these at school as well. You can also let your child know she can count in her head until the negative feeling goes away. This will help her realize that, eventually, the feeling of frustration and anger does start to alleviate on its own, even if she doesn’t act on it. Your child can also use journaling, music, drawing, clay, or any other non-destructive activity they might be interested in to release feelings. Some children break their own things when they’re upset or angry. If your child gets angry, throws his phone and it breaks, the natural consequence is that he no longer has a phone. Don’t buy him a new one. We call this a natural consequence and they are one of the best opportunities for your child to learn that his behavior matters. No matter the reason for your child’s behavior, she needs to be held accountable. If your teenager puts a hole in your wall and it costs $100 to fix it, how will you get that money back? You may offer opportunities for him to “work it off” around the house through chores. If your child is truly remorseful for his behavior, he’ll be willing to work it off. If not, you’ll need to use more creative ways of recouping that money. How much do you normally spend on school clothes at the mall? $200? Well, if your child isn’t willing to work off her debt, you may choose to give her $100 for her clothes instead. She’ll still get clothes, but maybe from a less expensive store. Wearing no-name jeans might make her uncomfortable enough to stop and think before she breaks things again in the future. Take a minute to identify in what ways—even small ways—you spend money on your child. Think of things that aren’t necessities. Remember, there’s a difference between needs and wants. Your child needs to eat. But he wants McDonald’s. You’re obligated, as his parent, to provide him with food, but you not obligated to pay for McDonald’s. A peanut butter and jelly sandwich at home is sufficient. You will likely respond to your child’s destructive behavior based on several factors: your child’s age, the extent of damage that was done, and the frequency of your child’s destructive behavior. You may even choose to make a police report if the destruction of your property is severe enough or frequent enough. What if your 12-year-old gets angry and breaks a lamp in the house? You may decide it’s sufficient to have him bring his lunch to school (rather than pay for hot lunches) until the object he broke is paid for. But what if your 15-year-old smashes your car windshield causing thousands of dollars in damage? You may decide it warrants a police report. And it may be something that actually requires such a report for insurance purposes. Whether you involve the police is a decision only you can make as a parent. The benefit to making a report is that, even if your child isn’t charged, you’re starting a paper trail. This paper trail is important if your child does end up in the court system and you need written proof to back up your claims and to get him the services he may need. If your child is at a point where he’s enraged, breaking things left and right, and appears to be escalating to the point of being a danger to himself or others, that’s a time when calling the police is appropriate as a safety precaution. When in doubt, ask yourself, “What would I do if this was a neighbor’s kid?” If your neighbor’s 11-year-old-son causes minor damage to your property, and it’s the first offense, you might try to work something out with his parents. But what about for more serious issues? At what point would you consider the damage serious enough to make a police report? And how do you think a neighbor would respond to your child if he exhibited the same level of property damage while at their home? Try to think of property destruction as a learning opportunity. Your job as a parent is to prepare your child for adult life. For adults, if you destroy property, there are consequences. Sometimes those consequences are financial and sometimes legal. You want to respond to your child’s destructive behavior in a way that leaves no doubt about what he will experience should he engage in this behavior outside your home. One parent shared his reluctance to give consequences for his child’s destructive behavior: “She was just really upset when she kicked a hole in the wall. She felt terrible afterward.” Maybe so, and it’s good if your child appears to have remorse for her actions, but she still must be held accountable. In her adult life, if that same young lady is in front of the judge after smashing in her ex-boyfriend’s taillights, and says, “I’m really sorry, Your Honor. I was just so upset,” it’s not going to save her from consequences. Parents often feel angry—even furious—when their child damages their property. That’s completely understandable. Property destruction is a personal violation and it hurts to have a child treat something that we’ve worked hard for with such little respect. Nevertheless, remind yourself that this is about your child’s poor coping and not about you personally. Doing so will make you respond more effectively. And it will make you feel better. Remember, if you don’t hold your child responsible for his behavior, you’re not doing him any favors as he prepares for the real world. Holding your child responsible for damages to your property is done out of love and respect. The bottom line is that you are teaching healthy limits and boundaries when you hold him accountable. Put these suggestions into practice today, but be patient. Your child will need time and practice to learn better coping skills. So, as best you can, calmly and persistently hold your child accountable. These things can take time, but the effort is worth it. Also check out The ODD Lifeline®, a step-by-step guide for managing even the most explosive, resistant kids—age 5 to young adult.